Our objective is to understand the factors governing the climate of a planet. In this chapter we will be concerned with energy balance and planetary temperature. Certainly, there is more to climate than temperature, but equally certainly temperature is a major part of what is meant by "climate," and greatly affects most of the other processes which come under that heading. From the preceding chapter, we know that the temperature of a chunk of matter provides a measure of its energy content. Suppose that the planet receives energy at a certain rate. If uncompensated by loss, energy will accumulate and the temperature of some part of the planet will increase without bound. Now suppose that the planet loses energy at a rate that increases with temperature. Then, the temperature will increase until the rate of energy loss equals the rate of gain. It is this principle of energy balance that determines a planet's temperature. 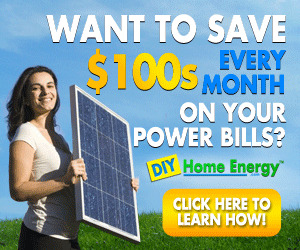 To quantify the functional dependence of the two rates, one must know the nature of both energy loss and energy gain. The most familiar source of energy warming a planet is the absorption of light from the planet's star. This is the dominant mechanism for rocky planets like Venus, Earth and Mars. It is also possible for energy to be supplied to the surface by heat transport from the deep interior, fed by radioactive decay, tidal dissipation, or high temperature material left over from the formation of the planet. Heat flux from the interior is a major player in the climates of some gas giant planets, notably Jupiter and Saturn, because fluid motions can easily transport heat from the deep interior to the outer envelope of the planet. The sluggish motion of molten rock, and even more sluggish diffusion of heat through solid rock, prevent internal heating from being a significant part of the energy balance of rocky planets. Early in the history of a planet, when collisions are more common, the kinetic energy brought to the planet in the course of impacts with asteroids and planetesimals can be a significant part of the planet's energy budget. There are many ways a planet can gain energy, but essentially only one way a planet can lose energy. Since a planet sits in the hard vaccuum of outer space,and its atmosphere is rather tightly bound by gravity, not much energy can be lost through heated matter streaming away from the planet. The only significant energy loss occurs through emission of electromagnetic radiation, most typically in the infrared spectrum. The quantification of this rate, and the way it is affected by a planet's atmosphere, leads us to the subject of blackbody radiation. It is a matter of familiar experience that a sufficiently hot body emits light - hence terms like "red hot" or "white hot." Once it is recognized that light is just one form of electromagnetic radiation, it becomes a natural inference that a body with any temperature at all should emit some form of electromagnetic radiation, though not necessarily visible light. Thermodynamics provides the proper tool for addressing this question. Imagine a gas consisting of two kinds of molecules, labeled A and B. Suppose that the two species interact strongly with each other, so that they come into thermodynamic equilibrium and their statistical properties are characterized by the same temperature T. Now suppose that the molecules A are ordinary matter, but that the "molecules" B are particles of electromagnetic radiation ("photons") or, equivalently, electromagnetic waves. If they interact strongly with the A molecules, whose energy distribution is characterized by their temperature T in accord with classical thermodynamics, the energy distribution of the electromagnetic radiation should also be characterized by the same temperature T. In particular, for any T there should be a unique distribution of energy amongst the various frequencies of the waves. This spectrum can be observed by examining the electromagnetic radiation leaving a body whose temperature is uniform. The radiation in question is known as blackbody radiation because of the assumption that radiation interacts strongly with the matter; any radiation impinging on the body will not travel far before it is absorbed, and in this sense the body is called "black" even though, like the Sun, it may be emitting light. Nineteenth century physicists found it natural to seek a theoretical explanation of the observed properties of blackbody radiation by applying well-established thermodynamical principles to electromagnetic radiation as described by Maxwell's classical equations. The attempt to solve this seemingly innocuous problem led to the discovery of quantum theory, and a revolution in the fundamental conception of reality. Radiation is characterized by direction of propagation and frequency (and also polarization, which will not concern us). For electromagnetic radiation, the frequency v and wavelength A are related by the dispersion relation vA = c, where c is a constant with the dimensions of velocity. Because visible light is a familiar form of electromagnetic radiation, c is usually called "the speed of light." The wavenumber, defined by n = A-1 = v/c is often used in preference to frequency or wavelength. The wavenumber can be viewed as the frequency measured in alternate units, and so we will often refer to wavenumber and frequency interchangeably. Although mks units are preferred throughout this book, we follow spectroscopic convention and make an exception for wavenumber when dealing with infrared radiation, which will usually be measured in cm-1 since it yields comfortable and familiar ranges of numbers. Wavelengths themselves will sometimes be measured in pm (microns, or 10-6m). Figure 3.1 gives the approximate regions of the electromagnetic spectrum corresponding to common names such as "Radio Waves" and so forth. If a field of radiation consists of a mixture of different frequencies and directions, the mixture is characterized by a spectrum, which is a function describing the proportions of each type of radiation making up the blend. A spectrum is a density describing the amount of electromagnetic energy contained in a unit volume of the space (3D position, frequency, direction) needed to characterize the radiation, just as the mass density of a three dimensional object describes the distribution of mass in three-dimensional space. Ultraviolet g il il öS "
Figure 3.1: The electromagnetic spectrum. The Median Emission Temperature is the temperature of a blackbody for which half of the emitted power is below the given frequency (or equivalently, wavelength or wavenumber). The Peak-v Temperature is the temperature of a blackbody for which the peak of the Planck density in frequency space is at the stated frequency. The Peak-A Temperature is the temperature of a blackbody for which the peak of the Planck density in wavelength space is at the stated wavelength. Before proceeding, we must pause and talk a bit about how the "size" of collections of directions are measured in three dimensions. For collections of directions on the plane, the measure of the "size" of the set of directions between two directions is just the angle between those directions. The angle is typically measured in radians; the measure of the angle in radians is the length of the arc of a unit circle whose opening angle is the angle we are measuring. The set of all angles in two dimensions is then 2n radians for example. A collection of directions in three dimensional space is called a solid angle. A solid angle can sweep out an object more complicated than a simple arc, but the "size" or measure of the solid angle can be defined through a generalization of the radian, known as the steradian. The measure in steradians of a solid angle made by a collection of rays emanating from a point P is defined as the area of the patch of the unit sphere centered on P which the rays intersect. For example, a set of directions tracing out a hemisphere has measure 2n steradians, while a set of directions tracing out the entire sphere (i.e. all possible directions) has measure 4n steradians. If we choose some specific direction (e.g. the vertical) as a reference direction, then a direction in three dimensional space can be specified in terms of two angles, 0 and where theta is the angle between the reference direction and the direction we are specifying, and ^ is the angle along a circle centered on the reference direction. These angles define a spherical polar coordinate system with the reference direction as axis; 0 > 0 < n and 0 > ^ < 2n. In terms of the two direction angles, the differential of solid angle Q is dQ = sin 0d0 d^ = — (dcos 0)(d^). Generally, when writing the expression for dQ in the latter form we drop the minus sign and just remember to flip the direction of integration to make the solid angle turn out positive. We recover the area of the unit sphere by integrating dQ over cos 0 = —1 to cos 0 = 1 and ^ = 0 to ^ = 2n. A similar integration shows that the set of directions contained within a cone with vertex angle A0 measured relative to the altitude of the cone has measure 2n(1 — cos A0) steradians. A narrow cone with A0 ^ 1 has measure n(A0)2 steradians. We wish to characterize the energy in the vicinity of a point r in three dimensional space, with frequency near v and direction near that given by a unit vector n. The energy spectrum S(r, v, n) at this point is defined such that the energy contained in a finite but small sized neighborhood of the point (r, v, n) is SdVdvdQ, where dV is a small volume of space, dv is the width of the frequency band we wish to include, and dQ measures the range of solid angles we wish to include. Since electromagnetic waves in a vacuum move with constant speed c, the energy flux through a flat patch perpendicular to n with area dA is simply cSdAdvdQ, which defines the flux spectrum cS. In mks units, the flux spectrum has units of (Watts/m2)/(Hz • steradian), where the Hertz (Hz) is the unit of frequency, equal to one cycle per second. The flux spectrum defined in this way is usually called the spectral irradiance; integrated over all frequencies, it is called the irradiance. Exercise 3.2.1 The mks unit of energy is the Joule, J, which is 1 Newton ■ meter/sec. A Watt (W) is 1J/sec. A typical resting human in not-too-cold weather requires about 2000Calories/day. (A Calorie is the amount of energy needed to increase the temperature of 1Kg of pure water by 1K.) Convert this to a power consumption in W, using the fact that 1Calorie = 4184J. The bold assumption introduced by Planck is that electromagnetic energy is exchanged only in amounts that are multiples of discrete quanta, whose size depends on the frequency of the radiation, in much the same sense that a penny is the quantum of US currency. Specifically, the quantum of energy for electromagnetic radiation having frequency v is AE = hv, where h is now known as Planck's constant. It is (so far as currently known) a constant of the universe, which determines the granuarity of reality. h is an exceedingly small number (6.626 • 10-34 Joule — seconds), so quantization of energy is not directly manifest as discreteness in the energy changes of everyday objects. A 1 watt blue nightlight (wavelength .48 ^m, or frequency 6.24 • 1014Hz emits 2.4-1018 photons each second, so it is no surprise that the light appears to be a continuous stream. If a bicycle were hooked to an electrical brake that dissipated energy by driving a blue light, emitting photons, the bike would indeed slow down in discontinuous increments, but the velocity increment, assuming the bike and rider to have a mass of 80kg, would be only 10-10m/s; if one divides a 1m/s decrease of speed into 1010 equal parts, the deceleration will appear entirely continuous to the rider. Nonetheless, the aggregate effect of microscopic graininess of energy transitions exert a profound influence on the macroscopic properties of everyday objects. Blackbody radiation is a prime example of this. where k is the Boltzmann thermodynamic constant defined in Chapter 2. B(v, T) is known as the Planck function. Note that the Planck function is independent of the direction of the radiation; this is because blackbody radiation is isotropic, i.e. equally intense in all directions. In a typical application of the Planck function, we wish to know the flux of energy exiting the surface of a blackbody through a small nearly flat patch with area dA, over a frequency band of width dv. Since energy exits through this patch at all angles, we must integrate over all directions. However, energy exiting in a direction which makes an angle 0 to the normal to the patch contributes a flux (BdAdvd^)cos 0 through the patch, since the component of flux parallel to the patch carries no energy through it. Further, using the definition of a steradian, d^ = 2nd cos 0 for the set of all rays making an angle 0 relative to the normal to the patch. Integrating B cos 0dQ from 0 = 0 to 0 = n/2, and using the fact that B is independent of direction, we then find that the flux through the patch is nBdAdv. This is also the amount of electromagnetic energy in a frequency band of width dv that would pass each second through a hoop enclosing area dA (from one chosen side to the other), placed in the interior of an ideal blackbody; an equal amount passes through the hoop in the opposite sense. The way the angular distribution of the radiation is described by the Planck function can be rather confusing, and requires a certain amount of practice to get used to. The following exercise will test the readers' comprehension of this matter. Exercise 3.2.2 A radiation detector flies on an airplane a distance H above an infinite flat plain with uniform temperature T. The detector is connected to a watt-meter which reports the total radiant power captured by the detector. The detector is sensitive to rays coming in at angles < SO relative to the direction in which the detector is pointed. The area of the aperture of the detector is SA. The detector is sensitive to frequencies within a small range Sv centered on v0. If the detector is pointed straight down, what is the power received by the detector? What is the size of the "footprint" on the plain to which the detector is sensitive? How much power is emitted by this footprint in the detector's frequency band? Why is this power different from the power received by the detector? How do your answers change if the detector is pointed at an angle of 45o relative to the vertical, rather than straight down? The Planck function depends on frequency only through the dimensionless variable u = hv/(kT). Recalling that each degree of freedom has energy 1 kT in the average, we see that u is half the ratio of the quantum of energy at frequency v to the typical energy in a degree of freedom of the matter with which the electromagnetic energy is in equilibrium. When u is large, the typical energy in a degree of freedom cannot create even a single photon of frequency v, and such photons can be emitted only by those rare molecules with energy far above the mean. This is the essence of the way quantization affects the blackbody distribution - through inhibition of emission of high-frequency photons. On the other hand, when u is small, the typical energy in a degree of freedom can make many photons of frequency v, and quantization imposes less of a constraint on emission. The characteristic frequency kT/h defines the crossover between the classical world and the quantum world. Much lower frequencies are little affected by quantization, whereas much higher frequencies are strongly affected. At 300K, the crossover frequency is 6240GigaHz, corresponding to a wavenumber of 20814m-1, or a wavelength of 48 pm; this is in the far infrared range. In the classical limit, u ^ 1, and u-/(exp(u)-1) « u2. Hence, B « 2kTv2/c2, which is independent of h. In a classical world, where h = 0, this form of the spectrum would be valid for all frequencies, and the emission would increase quadratically with frequency without bound; a body with any nonzero temperature would emit infrared at a greater rate than microwaves, visible light at a greater rate than infrared, ultraviolet at a greater rate than visible, X-rays at a greater rate than ultraviolet, and so forth. Bodies in equilibrium would cool to absolute zero almost instantaneously through emission of a burst of gamma rays, cosmic rays and even higher frequency radiation. This is clearly at odds with observations, not least the existence of the Universe. We are saved from this catastrophe by the fact that h is nonzero, which limits the range of validity of the classical form of B. At frequencies high enough to make u ^ 1, then u-/(exp(u) - 1) « u-exp(-u) and the spectrum decays somewhat more slowly than exponentially as frequency is increased. The peak of B occurs at u « 2.821, implying that the frequency of maximum emission is v « (2.821k/h)T « 58.78 • 109T. The peak of the frequency spectrum increases linearly with temperature. This behavior, first deduced empirically long before it was explained by quantum theory, is known as the Wien Displacement Law. Because the emission decays only quadratically on the low frequency side of the peak, but decays exponentially on the high frequency side, bodies emit appreciable energy at frequencies much lower than the peak emission, but very little at frequencies much higher. For example, at one tenth the peak frequency, a body emits at a rate of 4.8% of the maximum value. However, at ten times the peak frequency, the body emits at a rate of only 8.9 • 10-9 of the peak emission. The microwave emission from a portion of the Earth's atmosphere with temperature 250K (having peak emission in the infrared) is readily detectable by satellites, whereas the emission of visible light is not. 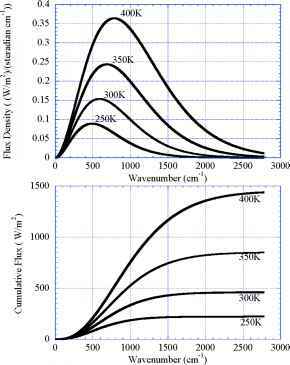 Figure 3.2: The spectrum of blackbody radiation for the various temperatures indicated on the curves. Upper Panel: The Planck density in wavenumber space. Lower Panel: The cumulative emission as a function of wavenumber. Note that the density has been tranformed such that the density times dn is the power per unit solid angle per unit area radiated in a wavenumber interval of width dn. the wavenumber of maximum emission in terms of the frequency of maximum emission using nmax = vmax/c. An important property of the Planck function, readily verified by a simple calculation, is that dB/dT > 0 for all wavenumbers. This means that the Planck function for a large temperature is strictly above one for a lower temperature, or equivalently, that increasing temperature increases the emission at each individual wavenumber. where u = hv/kT = hc/AkT, as before. Transforming to wavelength space changes the shape of the flux spectrum. BA has its maximum at u « 4.965, which is nearly twice as large as the value for the wavenumber or frequency spectrum. Note that in defining the cumulative emission we have included the factor n which results from integrating over all angles of emission in a hemisphere. Fcum(v, T) thus gives the power emitted per square meter for all frequencies less than v, or equivalently, for all wavelengths greater than c/v. 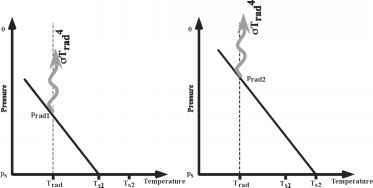 This function is shown for various temperatures in the lower panel of Fig. 3.2, where it is plotted as a function of wavenumber. The value of v for which Fcum(v, T)reaches half the net emission Fcum(w, T) provides a natural characterization of the spectrum. We will refer to this characteristic frequency as the median emission frequency. 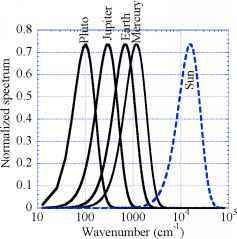 The median emission wavelength and wavenumber is defined analogously. Whether one uses frequency, wavelength or some other measure, the median emission is attained at u « 3.503. For any given coordinate used to describe the spectrum, the (angle-integrated) Planck density in that coordinate is the derivative of the cumulative emission with respect to the coordinate. Hence the peak in the Planck density just gives the point at which the cumulative emission function has its maximum slope. This depends on the coordinate used, unlike the point of median emission. Figure 3.1 shows the the portion of the spectrum in which blackbodies with various temperatures dominantly radiate. For example, a body with a temperature of around 4K radiates in the microwave region; this is the famous "Cosmic Microwave Background Radiation" left over from the Big Bang 1. A body with a temperature of 300K radiates in the infrared, one with a temperature of a few thousand degrees radiates in the visible, and one with a temperature of some tens of thousands of degrees would radiate in the ultraviolet. 1 What is remarkable about this observed cosmic radiation is not so much that it is in the microwave region, but that it has a blackbody spectrum, which says much about the interaction of radiation with matter in the early moments of the Universe. where 2 a = 2n5k4/(15c2h3) « 5.67 • 10-8Wm-2K-4. The constant a is known as the Stefan-Boltzmann constant, and the law F = aT4 is the Stefan-Boltzmann law. This law was originally deduce from observations, and Boltzmann was able to derive the fourth-power scaling in temperature using classical thermodynamic reasoning. However, classical physics yields an infinite value for the constant a. The formula for a clearly reveals the importance of quantum effects in determining this constant, since a diverges like 1/h3 if we try to pass to the classical limit by making h approach zero. An important property of an ideal blackbody is that the radiation leaving its surface depends only on the temperature of the body. If a blackbody is interposed between an observer and some other object, all properties of the object will be hidden from the observer, who will see only blackbody radiation corresponding to the temperature of the blackbody. This remark allows us to make use of blackbody theory to determine the emission from objects whose temperature varies greatly from place to place, even though blackbody theory applies, strictly speaking, only to extensive bodies with uniform temperature. For example, the temperature of the core of the Earth is about 6000K, but we need not know this in order to determine the radiation emitted from the Earth's surface; the outermost few millimeters of rock, ice or water at the Earth's surface contain enough matter to act like a blackbody to a very good approximation. Hence, the radiation emitted from the surface depends only on the temperature of this outer skin of the planet. Similarly, the temperature of the core of the Sun is about 16,000,000K and even at a distance from the center equal to 90% of the visible radius, the temperature is above 600,000K. However, the Sun is encased in a layer a few hundred kilometers thick which is sufficiently dense to act like a blackbody, and which has a temperature of about 5780K. This layer is known as the photosphere, because it is the source of most light exiting the Sun. Layers farther out from the center of the Sun can be considerably hotter than the photosphere, but they have a minimal effect on solar radiation because they are so tenuous. In Chapter 4 we will develop more precise methods for dealing with tenuous objects, such as atmospheres, which peter out gradually without having a sharply defined boundary. An ideal blackbody would be opaque at all wavelengths, but it is a common situation that a material acts as a blackbody only in a limited range of wavelengths. Consider the case of window glass: It is transparent to visible light, but if you could see it in the infrared it would look as opaque as stone. Because it interacts strongly with infrared light, window glass emits blackbody radiation in the infrared range. At temperatures below a few hundred K, there is little blackbody emission at wavelengths shorter than the infrared, so at such temperatures the net power per unit area emitted by a pane of glass with temperature T is very nearly aT4, even though it doesn't act like a blackbody in the visible range. Liquid water, and water ice, behave similarly. Crystalline table salt, and carbon dioxide ice, are nearly transparent in the infrared as well as in the visible, and in consequence emit radiation at a much lower rate than expected from the blackbody formula. (They would make fine windows for creatures having infrared vision). There is, in fact, a deep and important relation between absorption and emission of radiation, which will be discussed in Section 3.5. • The only source of energy heating the planet is absorption of light from the planet's host star. • The albedo, or proportion of sunlight reflected, is spatially uniform. • The planet is spherical, and has a distinct solid or liquid surface which radiates like a perfect blackbody. • The planet's temperature is uniform over its entire surface. • The planet's atmosphere is perfectly transparent to the electromagnetic energy emitted by the surface. The uniform-temperature assumption presumes that the planet has an atmosphere or ocean which is so well stirred that it is able to rapidly mix heat from one place to another, smoothing out the effects of geographical fluctuations in the energy balance. The Earth conforms fairly well to this approximation. The equatorial annual mean temperature is only 4% above the global mean temperature of 286K, while the North polar temperature is only 10% below the mean. The most extreme deviation occurs on the high Antarctic plateau, where the annual mean South polar temperature is 21% below the global mean. The surface temperature of Venus is even more uniform than that of Earth. That of Mars, which in our era, has a thin atmosphere and no ocean, is less uniform. Airless, rocky bodies like the Moon and Mercury do not conform at all well to the uniform temperature approximation. Light leaving the upper layers of the Sun and most other stars takes the form of blackbody radiation. It is isotropic, and its flux and flux spectrum conform to the blackbody law corresponding to the temperature of the photosphere, from which the light escapes. Once the light leaves the surface of the star, however, it expands through space and does not interact significantly with matter except where it is intercepted by a planet. Therefore, it is no longer blackbody radiation, though it retains the blackbody spectrum. In the typical case of interest, the planet orbits its star at a distance that is much greater than the radius of the star, and itself has a radius that is considerably smaller than the star and is hence yet smaller than the orbital distance. In this circumstance, all the rays of light which intersect the planet are very nearly parallel to the line joining the center of the planet to the center of its star; the sunlight comes in as a nearly parallel beam, rather than being isotropic, as would be the case for true blackbody radiation. The parallel-beam approximation is equivalent to saying that, as seen from the planet, the Sun occupies only a small portion of the sky, and as seen from the Sun the planet also occupies only a small portion of the sky. Even for Mercury, with a mean orbital distance of 58, 000,000km, the Sun (whose radius is 695,000km) occupies an angular width in the sky of only about 2 • 695, 000/58, 000,000 radians, or 1.4o. The solar flux impinging on the planet is also reduced, as compared to the solar flux leaving the photosphere of the star. The total energy per unit frequency leaving the star is 4nrQ(nB(v,To)), where tq is the radius of the star and To is the temperature of its photosphere. At a distance r from the star, the energy has spread uniformly over a sphere whose surface area is 4nr2; hence at this distance, the energy flux per unit frequency is nBrQ/r2, and the total flux is ctTqtQ/r2. The latter is the flux seen by a planet at orbital distance r, in the form of a beam of parallel rays. It is known as the solar "constant" , and will be denoted by Lq, or simply L where there is no risk of confusion with latent heat. The solar (or stellar) "constant" depends on a planet's orbit, but the luminosity of the star is an intrinsic property of the star. The stellar luminosity is the net power output of a star, and if the star's emission can be represented as blackbody radiation, the luminosity is given by Iq = 4nrQTq . Formula 3.7 shows that the blackbody temperature of a planet is much less than that of the photosphere, so long as the orbital distance is large compared to the stellar radius. From the displacement law, it follows that the planet loses energy through emission at a distinctly lower wavenumber than that at which it receives energy from its star. This situation is illustrated in Figure 3.3. For example, the energy received from our Sun has a median wavenumber of about 15000 cm-1, equivalent to a wavelength of about .7 pm. An isothermal planet at Mercury's orbit would radiate to space with a median emission wavenumber of 1100 cm-1, corresponding to a wavelength of 9 pm. An isothermal planet at the orbit of Mars would radiate with a median wavenumber of 550 cm-1, corresponding to a wavelength of 18 pm. Exercise 3.3.1 A planet with zero albedo is in orbit around an exotic hot star having a photo-spheric temperature of 100,000K. The ratio of the planet's orbit to the radius of the star is the same as for Earth (about 215). What is the median emission wavenumber of the star? In what part of the electromagnetic spectrum does this lie? What is the temperature of the planet? In what part of the electromagnetic spectrum does the planet radiate? Do the same if the planet is instead in orbit around a brown dwarf star with a photospheric temperature of 600K. The separation between absorption and emission wavenumber will prove very important when we bring a radiatively active atmosphere into the picture, since it allows the atmosphere to have a different effect on incoming vs. outgoing radiation. Since the outgoing radiation has longer wavelength than the incoming radiation, the flux of emitted outgoing radiation is often referred to as outgoing longwave radiation, and denoted by OLR. For a non-isothermal planet, the OLR is a function of position (e.g. latitude and longitude on an imaginary sphere tightly enclosing the planet and its atmosphere). We will also use the term to refer to the outgoing flux averaged over the surface of the sphere, even when the planet is not isothermal. 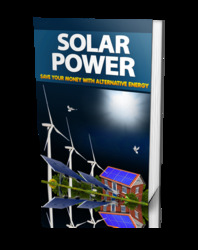 As for the other major term in the planet's energy budget, we will refer to the electromagnetic energy received from the planet's star as the shortwave or solar energy. Our own Sun has its primary output in the visible part of the spectrum, but it also emits significant amounts of energy in the ultraviolet and near-infrared, both of which are shorter in wavelength than the OLR by which planets lose energy to space. Figure 3.3: The Planck density of radiation emitted by the Sun and selected planets in radiative equilibrium with absorbed solar radiation (based on the observed shortwave albedo of the planets). The Planck densities are transformed to a logarithmic spectral coordinate, and all are normalized to unit total emission. have a mean surface temperature of about 280K. Venus would be only 50K warmer than the Earth and Mars only 53K colder. At the distant orbit of Jupiter, the blackbody equilibrium temperature falls to 122K, but even at the vastly more distant orbit of Neptune the temperature is still as high as 50K. The emission from all of these planets lies in the infrared range, though the colder planets radiate in the deeper (lower wavenumber) infrared. An exception to the strong separation between stellar and planetary temperature is provided by the "roasters" - a recently discovered class of extrasolar giant planets with ^ as low as 5. Such planets can have equilibrium blackbody temperatures as much as a third that of the photosphere of the parent star. For these planets, the distinction between the behavior of incoming and outgoing radiation is less sharp. Figure 3.4: The equilibrium blackbody temperature of an isothermal spherical zero-albedo planet, as a function of distance from a Sun having a photospheric temperarature of 5800K. The orbital distance is normalized by the radius of the Sun. Dots show the equilibrium blackbody temperature of the Solar System planets, based on their actual observed albedos. at Saturn's orbit we find a black body temperature of 85K. The observed surface temperature is about 95K, whence we conclude that the infrared effects of Titan's atmosphere moderately warm the surface. The way energy balance determines surface temperature is illustrated graphically in Figure 3.5. One first determines the way in which the mean infrared emission per unit area depends on the mean surface temperature Ts; for the isothermal blackbody calculation, this curve is simply aTf. 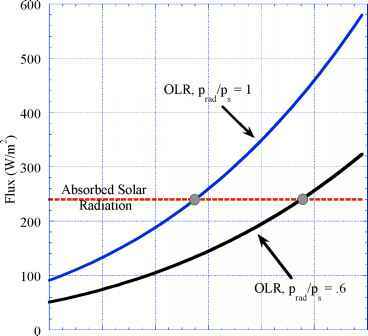 The equilibrium temperature is determined by the point at which the OLR curve intersects the curve giving the absorbed solar radiation (a horizontal line in the present calculation). In some sense, the whole subject of climate comes down to an ever-more sophisticated heirarchy of calculations of the curve OLR(Ts); our attention will soon turn to the task of determining how the OLR curve is affected by an atmosphere. With increasing sophistication, we will also allow the solar absorption to vary with Ts, owing to changing clouds, ice cover, vegetation cover, and other characteristics. Figure 3.5: Determination of a planet's temperature by balancing absorbed solar energy against emitted longwave radiation. 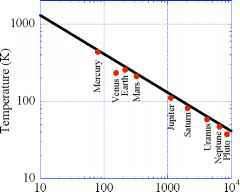 The horizontal line gives the absorbed solar energy per unit surface area, based on an albedo of .3 and a Solar constant of 1370W/m2. The OLR is given as a function of surface temperature. 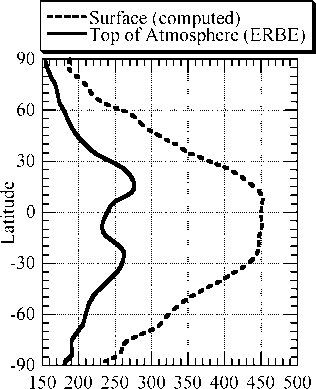 The upper curve assumes the atmosphere has no greenhouse effect (prad = ps), while the lower OLR curve assumes prad/ps = .6, a value appropriate to the present Earth. Figure 3.6: Sketch illustrating how the greenhouse effect increases the surface temperature. In equilibrium, the outgoing radiation must remain equal to the absorbed solar radiation, so Trad stays constant. However, as more greenhouse gas is added to the atmosphere, prad is reduced, so one must extrapolate temperature further along the adiabat to reach the surface. strongly with the outgoing (generally infrared) emitted radiation is called a greenhouse gas, and the corresponding effect on planetary temperature is called the greenhouse effect. Carbon dioxide, water vapor and methane are some examples of greenhouse gases, and the molecular properties that make a substance a good greenhouse gas will be discussed in Chapter 4. The mass of greenhouse gas that must be mixed into a column of atmosphere with base of 1 m2 in order to make that column act begin to act like a blackbody is characterized by the absorption coefficient k, whose units are m2/kg. Here we'll assume k to be independent of frequency, temperature and pressure, though for real greenhouse gases, k depends on all of these. Since the mass of greenhouse gas in a column of thickness Ap in pressure coordinates is qAp/g, then the definition of k implies that the slab acts like a blackbody when KqAp/g > 1. When Kqps/g < 1 then the entire mass of the atmosphere is not sufficient to act like a blackbody and the atmosphere is said to be optically thin. For optically thin atmospheres, infrared radiation can escape from the surface directly to space, and is only mildly attenuated by atmospheric absorption. When Kqps/g ^ 1, the atmosphere is said to be optically thick. If the atmosphere is optically thick, we can slice the atmosphere up into a stack of slabs with thickness Api such that KqApi/g = 1. Each of these slabs radiates like an ideal blackbody with temperature approximately equal to the mean temperature of the slab. Recall, however, that another fundamental property of blackbodies is that they are perfect absorbers (though if they are only blackbodies in the infrared, they will only be perfect absorbers in the infrared). Hence infrared radiation escapes to space only from the topmost slab. The OLR will be determined by the temperature of this slab alone, and will be insensitive to the temperature of lower portions of the atmosphere. The pressure at the bottom of the topmost slab is Api . We can thus identify Api as the characteristic pressure level from which radiation escapes to space, which therefore will be called prad in subsequent discussions. The radiation escaping to space - the OLR- will then be approximately <rT(prad)4. Because temperature decreases with altitude on the adiabat the OLR is less than aTs4 to the extent that prad < ps. As shown in Figure 3.5, a greenhouse gas acts like an insulating blanket, reducing the rate of energy loss to space at any given surface temperature. All other things being equal the equilibrium surface temperature of a planet with a greenhouse gas in its atmosphere must be greater than that of a planet without a greenhouse gas, in order to radiate away energy at a sufficient rate to balance the absorbed solar radiation. The key insight to be taken from this discussion is that the greenhouse effect only works to the extent that the atmosphere is colder at the radiating level then it is at the ground. For real greenhouse gases, the absorption coefficient varies greatly with frequency. Such gases act on the OLR by making the atmosphere very optically thick at some frequencies, less optically thick at others, and perhaps even optically thin at still other frequencies. In portions of the spectrum where the atmosphere is more optically thick, the emission to space originates in higher (and generally colder) parts of the atmosphere. In reality,then, the infrared escaping to space is a blend of radiation emitted from a range of atmospheric levels, with some admixture of radiation from the planet's surface as well. The concept of an effective radiating level nonetheless has merit for real greenhouse gases. It does not represent a distinct physical layer of the atmosphere, but rather characterizes the mean depth from which infrared photons escape to space. As more greenhouse gas is added to an atmosphere, more of the lower parts of the atmosphere become opaque to infrared, preventing the escape of infrared radiation from those regions. This increases the altitude of the effective radiating level (i.e. decreases prad). Some of the implications of a frequency-dependent absorption coefficient are explored in Problem ? ?, and the subject will be taken up at great length in Chapter 4. From an observation of the actual OLR emitted by a planet, one can determine an equivalent blackbody radiating temperature Trad from the expression aT4ad = OLR. This temperature is the infrared equivalent of the Sun's photospheric temperature; it is a kind of mean temperature of the regions from which infrared photons escape, and prad represents a mean pressure of these layers. For planets for which absorbed solar radiation is the only significant energy source, Trad is equal to the ideal blackbody temperature given by Eq. 3.7. The arduous task of relating the effective radiating level to specified concentrations of real greenhouse gases is treated in Chapter 4. Figure 3.7 illustrates the reduction of infrared emission caused by the Earth's atmosphere. At every latitude, the observed OLR is much less than it would be if the planet radiated to space at its observed surface temperature. At the Equator the observed OLR is 238W/m2, corresponding to a radiating temperature of 255K. This is much less than the observed surface temperature of 298K, which would radiate at a rate of 446W/m2 if the atmosphere didn't intervene. It is interesting that the gap between observed OLR and the computed surface emission is less in the cold polar regions, and especially small at the Winter pole. This happens partly because, at low temperatures, there is simply less infrared emission for the atmosphere to trap. However, differences in the water content of the atmosphere, and differences in the temperature profile, can also play a role. These effects will be explored in Chapter 4.